I don’t know how many of you can say you remember Farrell’s-Ice Cream Parlour Restaurant. Well, on Friday, I had the opportunity to dine at Farrell’s in Brea, for a VIP charity event for the non-profit Heroes and Patriots. As I stepped foot inside the restaurant I was immediately brought back to my child hood memories with the atmosphere. Every single person working was happy to be there, and the sound of people laughing and having a good time brought back those memories. Seeing that we were there for the charity event we were promptly seated. The girl that sat us was very cheerful and informed us that our server Nicole would be right with us. Nicole came very quickly and suggested a few fountain drinks, I started off with the Sarsaparilla and Jessica started with the Vanilla Coke. She quickly filled our drink order and returned to take our food order. I ordered under the Gourmet Pizzas “The Meaty Trio” which was topped with pepperoni, sausage and ham and Jessica ordered the Cobb Salad. When my pizza came out I was happy with the way it looked. It was a nice size with an even balance of the toppings. The crust had the right amount of crunch and it was complimented by the great flavors the toppings gave it. At this point I decided to try their Coke which the server brought out promptly Jessica also changed her drink to a Cherry Coke to which she says was the best that she has tasted. 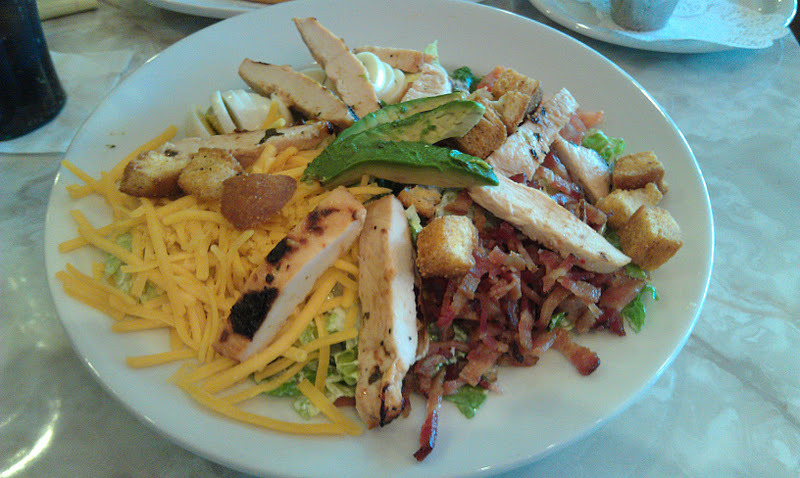 Jessica’s Cobb Salad was dressed like any other cob salad but it had a few surprises. The chicken was freshly cooked and the croutons were amazing with its fresh garlic and butter taste. We later found out that the croutons were freshly cooked daily. Jessica could not stop eating the salad to which I had to remind her we still had dessert coming. For dessert Jessica had the Caramel Nugget, both the hot fudge and caramel were hot and Spanish nuts gave it such a different taste, she loved it. I stuck with an Oreo shake, which was great. 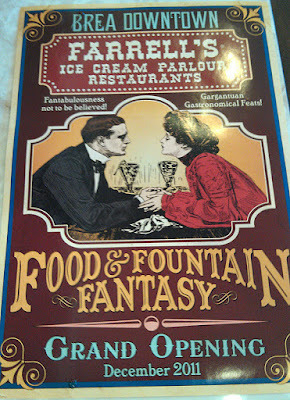 There was a lot of history put into the look and feel of the restaurant. From the floor to the ceilings, there was such a unique look. The walls were covered in history with pictures and menus from the past. The dining area was a nice size which included a patio area for outside dining. The lights throughout the restaurant had nice stained glass lamp shades, which helped with the look. There was three big screen TV’s displaying a slide show with new and old photos. 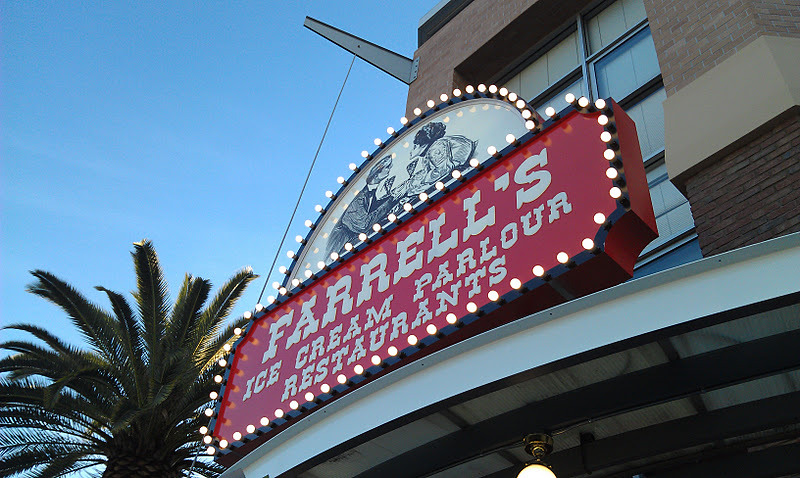 One of the things Farrell’s is known for is the excitement brought with celebrating your dessert, I mean special occasions. Picture your dessert coming out followed by the beat of the drum and the cheer of the servers all dressed up in their pin-striped vests, old fashioned ties, and cane hats. 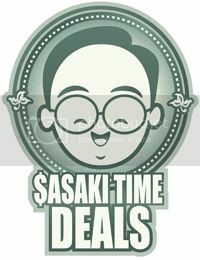 The restaurant was kept really clean, as soon the patrons left the table was cleared and floors were swept. I had the pleasure of speaking with the one of the Managers Dana, The President Paul Kramer, and the CEO Mike Fleming. It was great speaking with each one of them, I learned a little from each of them. 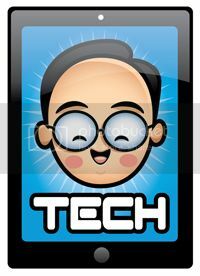 Mike was able to share a little about the founder Bob Farrell, who is now a motivational speaker with his “Give ’Em The Pickle”. 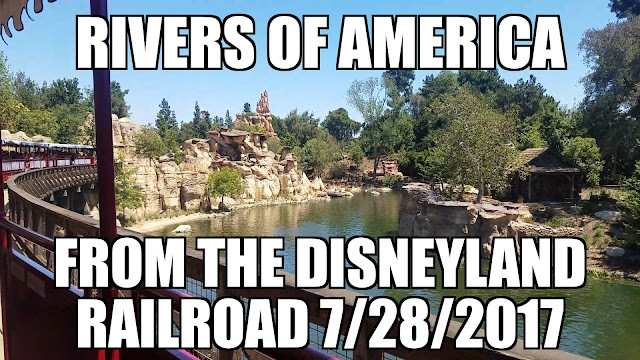 Mr. Farrell had the opportunity to work with Walt Disney at Disneyland where he learned much about hiring, training, and motivating employees before he opened Farrell’s. 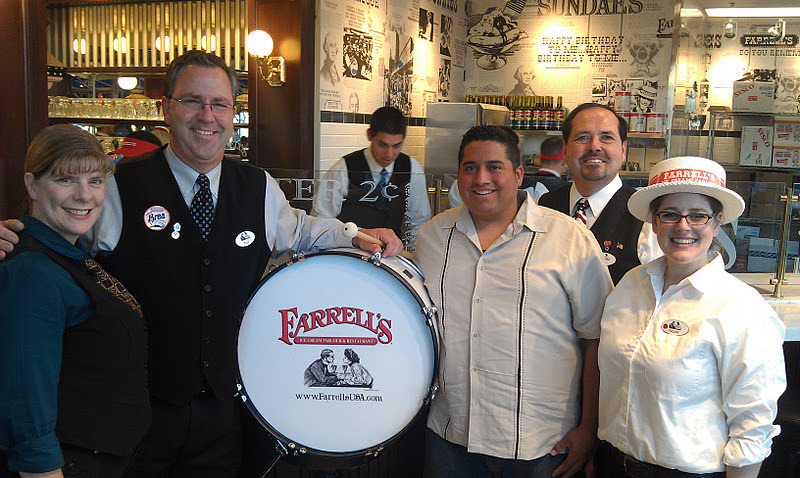 Farrell’s opens its doors on Monday December 26, 2011, 11AM to 11PM and is located on the corner of Brea Blvd. and Birch Street.